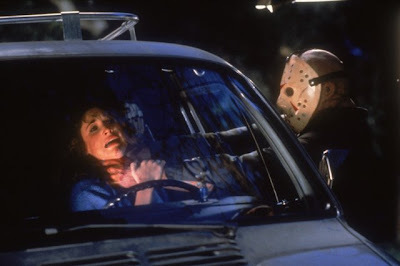 Aside from never wanting to go anywhere in a canoe, having a strange fear of guys named Jason, and getting freaked out by hockey masks--recently, I learned another valuable lesson from the Friday the 13th franchise and that is namely that all 3-D glasses are not alike. As my own version of recycling-- I kept the awesome looking James Bond 007 ones used for the RealD process from DreamWorks Animation and Paramount Pictures' Monsters vs. Aliens-- totally not getting that I'd have to go retro and opt for the blue and red cardboard '50s style ones for everything else. Distracting and tough on the eyes especially when you're wearing contacts-- my instant solution was to pop out the contacts and switch to glasses, wrapping the cardboard ones around to see Jason wreak havoc in three dimensions of '80s slasher movie carnage with my new blue and red peepers. In the new Blu-ray presentation of the fully remastered Friday the 13th Part 3 (previously available as a Deluxe Edition DVD earlier this year)-- similar to your ability to choose from 5.1 Dolby surround or now TrueHD or the vintage mono, you're also given the choice of watching the film in its theatrical 3-D presentation or the previously available home video 2-D option. Of course, the fact that I would've been an infant and would never have the opportunity to see it in 3-D aside from this release made me naturally inclined to go for that option as well as trying to recreate the original experience as much as possible by sticking with the mono soundtrack. While the beginning of the film brought viewers up to speed on the ending of Part 2 since it picks up directly after the events, sadly Amy Steel declined to return so we didn't know if Ginny would share Alice's fate a la the second film's conclusion of Adrienne King's storyline. Yet while that can be fully appreciated in 2-D, the decision to have Jason just seek out new attire and brutally dispatch an annoying, stereotypically white trash couple at the beginning seems a bit like overkill and a waste of 3-D.
By now, realizing that not only had the Friday the 13th franchise become so successful that as the titles announce, the movie is "A Jason Inc." production but also that viewers wouldn't be satisfied with just another rehash of the same plot executed in the evil twin siblings of parts one and two-- we find ourselves immersed in a whole new plot instead of witnessing just another variation of counselors behaving badly. Deciding to journey out to the same woods to stay at the family cabin owned by Chris (Dana Kimmell) as a way to face her fears and almost-- as we later discover-- being killed by Jason before, the group hasn't even arrived at the place before they meet the obligatory screw-loose old guy in the middle of the road holding an eyeball and telling them to return from whence they came as though the franchise had suddenly switched channels to the BBC for a moment. Ignoring the warning or maybe not knowing the word "whence," shortly after their arrival, Jason nearly gets upstaged when the most annoying character of the lot-- Larry Zerner's Shelly who consistently plays demented, scare inducing practical jokes on people-- and his blind date for the weekend (Catherine Parks) get on the bad side of a motorcycle gang that resemble rejected extras from the set of Fame. However, fortunately for the two main ensemble players, Jason doesn't want anyone getting in the way of his prey of the young and carefree so he reacts when the group is targeted by the motorcycle trio who-- adding insult to the outfits and upcoming injury-- are saddled with unspeakably awful names like Ali, Loco, and Fox. In one especially memorable surprise as Fox swings on a rope way up high from the barn, suddenly she vanishes inside and one by one, the three disappear along with the rest as director Steve Miner's twisted, horror version of Agatha Christie's Ten Little Indians finds the promiscuous, pot-smoking characters getting axed (or stabbed with whatever is handy). While this edition is cleaned up considerably in a new remastered presentation-- there's still a large amount of scratches and dirt that couldn't be removed or buffed out and Part 2 actually looked much better in its Blu-ray presentation, most likely because the very nature of 3-D makes us look too closely at the images we're being displayed to find the flaws we may otherwise have missed. As for the 3-D itself, some of the tricks involving a yo-yo, various weapons, and juggling make for a fun diversion but overall given the discomfort of trying to find a good viewing angle to watch the film with glasses or contacts-- we realize that as much as they try to dress it up with a new plot and the technical gimmick, it's still the same old movie where the body count increases and the logic decreases. 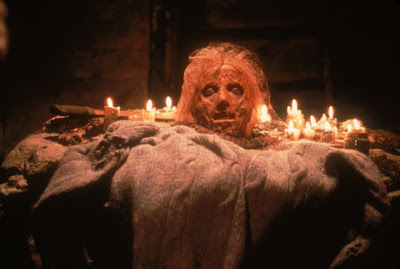 Despite that, it's bolstered by nice audience reward inclusions that pays homage to famous sequences in previous films and an in-joke as a character reads a magazine about the franchise's makeup artist Tom Savini. Likewise again, we encounter an incredibly strong heroine in Dana Kimmell's Chris for whom we truly root, however mostly we realize that other than the 3-D and finally giving Jason a distinct look with that iconic hockey mask in lieu of the burlap sack, it's just another Friday where the extras, technical presentation (aside from the great sound and improved but extremely dated picture) fail to liven it up. And by this point, I think it's safe to say that most audiences were beginning to yearn for not just the calendar to advance but with it the films in the franchise as well.